Solar Power: Eco-Friendly or Environmental Blight? California wants to run on sunshine. The state is forcing utility companies to provide 20% of their output by way of solar power and other forms of renewable energy by 2010. Last November, Governor Arnold Schwarzenegger said he wanted the portion to be one-third by 2020. Now the feds are bringing the money to help fund all this sunny energy, with the Obama Administration's stimulus package promising to pay for 30% of solar-power projects that begin by the end of 2010. Katherine Potter, a spokeswoman for Ausra, the company proposing the solar thermal plant, insists that large-scale solar is needed, and soon. "There is certainly a good place for distributed generation, but to ensure the reliability of the grid, you do need large-scale power generation," she says, explaining that solar thermal is the most efficient renewable energy source available in terms of the amount of land used. But it's not just annoyed neighbors and environmental attack dogs who are worried about these solar plants. John McKenzie is a planner for the County of San Luis Obispo, which is processing the applications for the photovoltaic projects. (The solar thermal project goes through the California Energy Commission.) "There are a couple of pretty serious issues that need to be resolved," he says, pointing specifically to the biological resources, water-supply concerns and agricultural protections that have to be evaluated before the county gives the go-ahead to the applicants. How much experience does he or anyone in the county have with these kinds of processes? "Zero," says McKenzie, a 20-year county-planning employee. "These are the two biggest plants in the world ... This county is getting to be one of the first folks to deal with it." Will any of these projects make it by 2010? "There's a possibility," he says, adding that the county is "making a concerted effort to keep time frames down" but that there could be a "whole slew of stumbling blocks." This isn't the first time solar has been proposed for the plains, however. Darrell Twisselman  whose family has lived in the area since the 1880s and whose land would host the two photovoltaic plants for a hefty profit  remembers when they built a solar photovoltaic plant there in the mid-1980s. 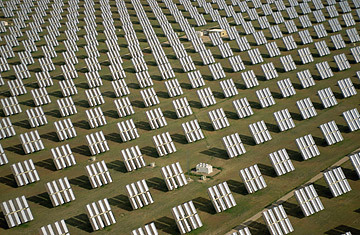 (At 6 megawatts, it was tiny compared with the current proposals, one of which has a 177-megawatt capacity.) The project faced similar gripes then. "Everyone complained about them for two weeks, and then everyone forgot," Twisselman says. "And they were what you might say unsightly. You could see them from everywhere." The technology, however, was worse then, and "the panels cooked," melting in their own heat, says Twisselman. That was just one reason the government pulled funding and the project was dismantled. Despite the earlier Carrisa solar experiment, the state feels it is still inexperienced in judging the impact of huge solar plants. According to California Energy Commission chairwoman Karen Douglas, "We've got much more experience siting natural-gas plants than siting renewables, both from a staff and commission perspective. So some issues are rising up in the renewables case that are substantively different than what has been the core of the siting work before the solar applications started coming in so quickly." Schwarzenegger has asked state agencies to streamline the process with an eye on speed (and the federal deadline) as well as the environment. But this process, which included a workshop held last week, is still in the early stages and is focused mainly on the Mojave and Colorado deserts, where other future solar plants would go. As such, it remains unclear how this process will affect the Carrisa Plains, especially with the pressure building for the 2010 deadline. Back on the plains, Strobridge is just trying to save the place he calls home. "At this point," he explains, "we're very frustrated and doing everything we can to make sure if something does come in, it's put in responsibly." See the top 10 green stories of 2008.